Because killing 20th-level PCs is fun! Long-time readers of my blog now that my campaigns (the Borderland of Adventure and the Shattered Star) tend to be low-level. In December 2010, we decided to try something a little different to celebrate Christmas. We decided to try a high-level slaughterfest. In this scenario, the party comprised the greatest heroes of a mighty kingdom. The kingdom was beset by a truly terrifying foe: Sygaxmere Etharvaeros a great red wyrm of unparalleled ferocity and battle-cunning. Their mission: destroy this dangerous threat and save the kingdom. Freard (a human cleric as cautious as Raligil was paranoid). 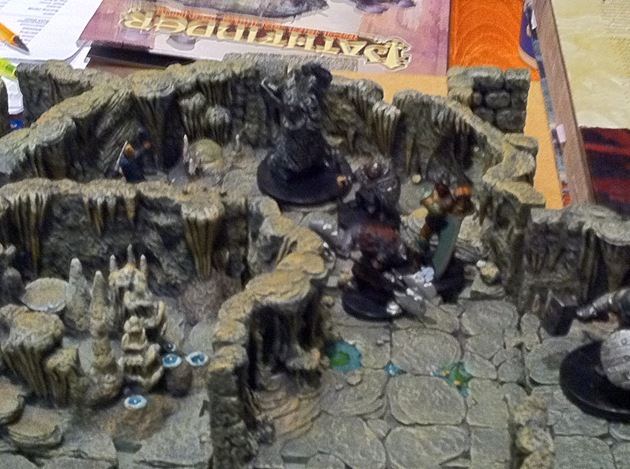 Having fought their way through Sygaxmere’s many lesser minions and plumbing the very depths of his fell fortress, the heroic adventurers breached his final lair. With them, and called by Raligil, came two gated solars—powerful extraplanar servants in the cause of good who would play almost no part in the proceedings. (In truth Raligil had wanted to bring balors with him, but Freard strenuously objected). Moving cautiously through the outer caverns they came into a vast chamber. Ahead, a cloud of smoke blocked their vision of much of the room while to their left seethed a huge pool of roiling lava. As the heroes moved further inside, a human figure (immediately determined to be a projected image) appeared in front of the smoke. The figure ordered the adventurers to surrender or they would face the wrath of the man’s master. Ignoring the offer, the adventurer’s attacked. Immediately, the image was dispelled and they moved further into the chamber. 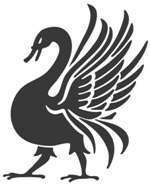 After a few moments, Sygaxmere himself burst forth from the pool of bubbling lava and flew into the main chamber. Laughing horribly, he cast a powerful spell—mage’s disjunction—onto the party, sweeping away their many magical protections (except on Kemeth who was fortunately out of the area of affect). Many of the party’s magical items were also nullified. It was now Dragonslayer’s luck plunged to new, hitherto unknown depths; two items—his armour and bow—were completely drained of magic by the powerful spell! Now no longer protected from the dragon’s frightful aura, all the party—with the exception of Dragonslayer—managed to fight off the feelings of terror that swept through him. As suddenly as he arrived, Sygaxmere disappeared—carried away by a quickened dimension door. A brief discussion about retreating, led to the party advancing further into the chamber (except for Dragonslayer who began to flee). 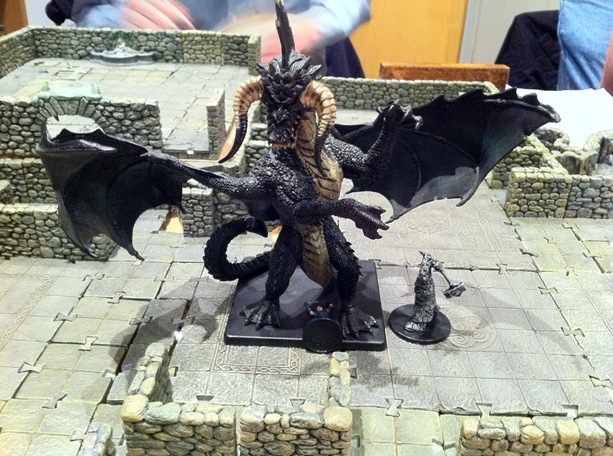 Again, the projected human male was spotted (this time hiding down by the lava) and Raligil moved in and cast time stop to augment his defences before using mage’s disjunction on the human—who was immediately revealed to be Parardar Levien, the dragon’s feared lich servant! Sadly, while Raligil stripped Paradar of his magical defences, deep below the lava Sygaxmere was preparing the second part of his dastardly plan by casting a widened antimagic field upon himself. Bursting forth from the lava once more he flew into the chamber, looked around and then dived at Raligil. Squeezing into his antimagic field, he enveloped the hapless sorcerer within it, negating all his remaining magical protections. With a single bite, he almost killed Raligil who fell unconscious in the dragon’s great fanged maw. 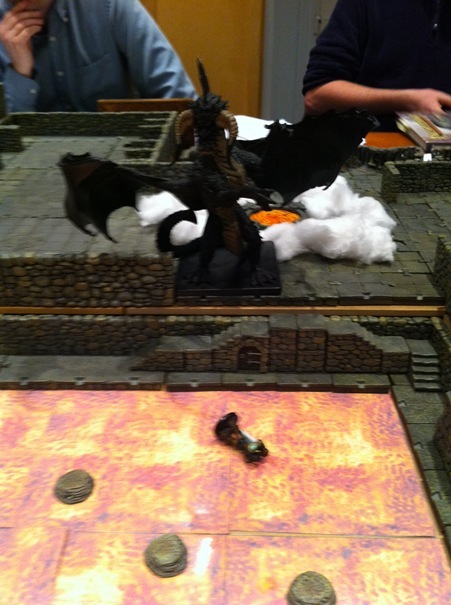 Several of the party then attacked Sygaxmere, one of the solars and Kemeth both injuring the dragon slightly. Meanwhile, Freard caught up with Dragonslayer and after dispelling the fighter’s fear protected them both with a blade barrier. In the next round, Sygaxmere once again bit Raligil (inflicting 230 points of damage with a successful critical hit) slaying him instantly. He then dropped the hapless sorcerer’s body into the bowl of lava at the centre of the chamber. Intent on avenging his friend, Kemeth raged, hewing mightily at the dragon, but his blow bounced off its thick scales. With but one target, Sygaxmere attacked Kemeth, inflicting a terrible bite wound and fastening his fangs about his target. The dragon disciple, though, was hardier than the unfortunate Raligil and survived the massive damage inflicted. To help his friend, Freard dropped the blade barrier and advanced while Dragonslayer hurled a javelin of lightning that was negated by the antimagic shield. Although Kemeth struggled mightily in the dragon’s maw he was unable to break free and in short order Sygaxmere bit him in half before hurling his shattered body into the lava. 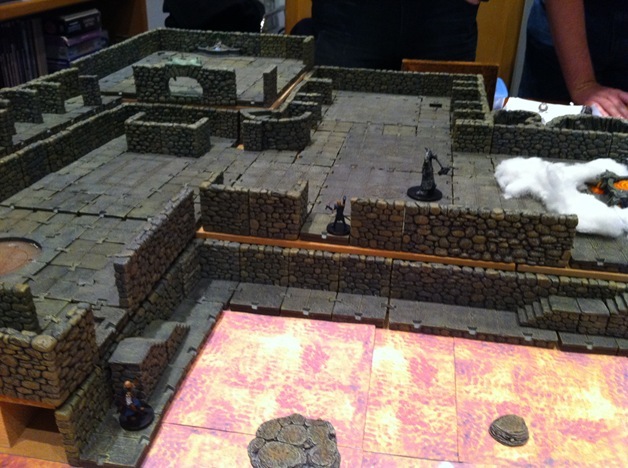 At this point, we called the session as it was late and none of the party possessed any meaningful methods of injuring or slaying the dragon (Raligil having run out of 9th-level spells and being completely without equipment declined to return). 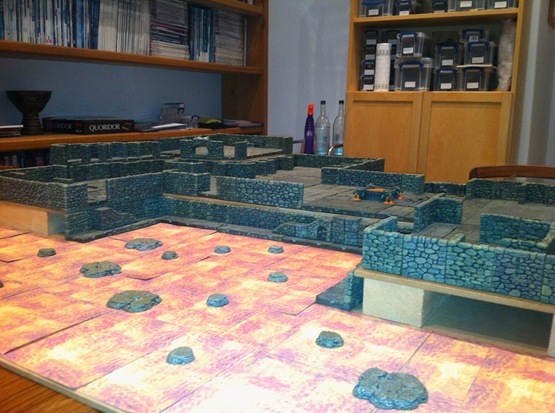 Although the combat only lasted nine rounds, game play took over three hours. That was cool as we took our time looking stuff up (and the party spent an hour buffing and plotting before combat began). It’s debatable whether Fread and Dragonslayer would have escaped – Sygaxmere’s movement being so much more than the carpet of flying. Final, fun note: I enjoyed running Sygaxmere so much I wrote him up properly and published him in Scions of Evil. If you need a truly horrible red dragon, you should check it out! Any new campaigns going or upcoming that we can expect some new game reports or journals? We are still battling through Shattered Star–you can read our session summaries via the Borderland of Adventure tab at the top of the page. Enjoy!